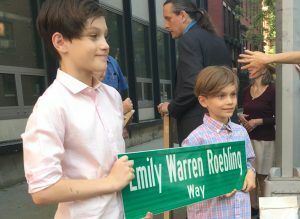 With the support of the BHA, the City Council approved renaming the corner of Columbia Heights and Orange Street for Emily Warren Roebling, who took over the completion of the Brooklyn Bridge after her husband was disabled by caisson disease in January 1879. This location is close to the home where she and Washington Roebling resided at 110 Columbia Heights, now no longer standing. A dedication ceremony in her honor took place on May 29, 2018, at which a street sign bearing her name was enthusiastically unveiled by her two youngest descendants, Augustus and Chase Roebling. 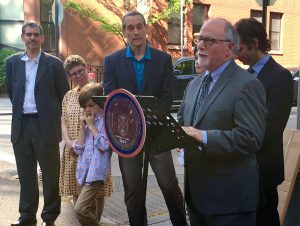 Council Member Steve Levin, who sponsored the re-naming request, opened the ceremony with remarks on Emily Roebling’s life and legacy, followed by Assembly Member Jo Ann Simon and a song by Dan Wiley from Congresswoman Nydia Velazquez’s office. Deborah Schwartz, President of the Brooklyn Historical Society read from a letter Mrs. Roebling’s wrote to her husband (from the Society’s collection), and Roebling’s biographer Marilyn Weigold shared more details of her life after the Bridge, her world travels and her involvement in women’s groups. The BHA’s executive director Peter Bray highlighted her pioneering legal career, followed by remarks by Kriss Roebling, Emily’s great great great grandson, and Doreen Gallo of the DUMBO Neighborhood Alliance.